NOTE: A fuse is provided in fuseblock cavity (f19) marked as Spare. Shifting from D (Drive) to P (Park) or R (Reverse) (or from P or R to D) should be done only after the accelerator pedal is released and the vehicle is stopped. Be sure to keep your foot on the brake when moving the shift lever between these gears. It is dangerous to shift the selector lever out of "P" or "N" if the engine speed is higher than idle speed. If your foot is not firmly on the brake pedal, the vehicle could accelerate quickly forward or in re­verse. You could lose control of the vehicle and hit someone or something. Only shift into gear when the engine is idling normally and when your right foot is firmly on the brake pedal. Supplements the parking brake by locking the trans­mission. The engine can be started in this range. Never use P (Park) while the vehicle is in motion. Apply the parking brake when leaving the vehicle in this range. Always apply the parking brake first, and then place the selector in P (Park) position. This vehicle is equipped with a brake transmission shift interlock system (BTSI) that holds the gearshift lever in the P (Park) position when the ignition switch is in the OFF position. 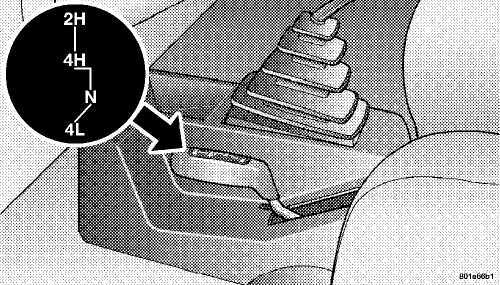 To move the gear selector lever out of the P (Park) position, the ignition switch must be turned to the ON position, the brake pedal and the button on the front of the shifter handle must be depressed. Unintended movement of a vehicle could injure those in and near the vehicle. As with all vehicles, you should never exit a vehicle while the engine is running. Before exiting a vehicle, you should always shift the vehicle into P (Park), remove the key from the ignition, and apply the parking brake. Once the key is removed from the ignition, the transmission shift lever is locked in the P (Park) position, securing the vehicle against unwanted movement. Further­more, you should never leave children unattended inside a vehicle. ensure it is in the P (Park) position. When engaged in P (Park), you will not be able to move the shifter rearward without depressing the shift lever button. Before moving the shift lever out of P (Park), you must turn the ignition from LOCK to ON so the steering wheel and shift lever are released. Other­wise, damage to the steering column or shifter could result. For moving the vehicle rearward. Always stop before moving the lever to R (Reverse), except when rocking the vehicle. Engine may be started in this position. Do not coast in N (Neutral) and never turn off the ignition to coast down a hill. These are unsafe practices that limit your response to changing traffic or road conditions. You might lose control of the vehicle. The transmission selector is in D (Drive). The O/D OFF switch has not been activated. strong head winds, or trailer towing), turning off over­drive will improve performance and extend transmission life by reducing excessive shifting and heat buildup. Overdrive can be locked out by pressing the O/D OFF switch located on the instrument panel. The O/D OFF indicator light (on the switch) will illuminate to show that the switch has been activated. When the indicator light is on, Overdrive is locked out. Pressing the switch a second time restores the Overdrive function. The lockout feature is useful when towing a trailer or carrying a heavy load. For moderate grades and to assist braking on dry pavement or in mud and snow. Begins at a stop in low gear with automatic upshift to 2nd gear. Will not shift to 3rd. For hard pulling at low speeds in mud, sand, snow, or on steep grades. Begins and stays in low gear with no upshift. Provides engine compression braking at low speeds. Never use P (Park) position with an automatic trans­mission as a substitute for the parking brake. Al­ways apply parking brake fully when parked to guard against vehicle movement and possible injury or damage. 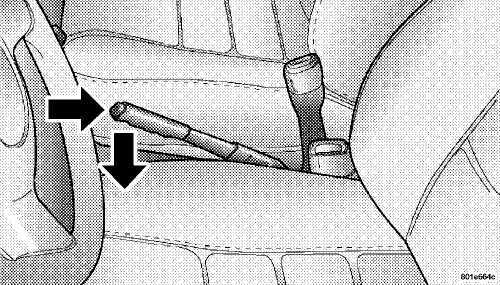 Before moving the shift lever out of P (Park), you must turn the ignition from LOCK so the steering wheel and shift lever are released. Otherwise, damage to steering column or shifter could result. Never race the engine with the brakes on and the vehicle in gear, and never hold the vehicle on an incline without applying the brakes. These prac­tices can overheat and damage the transmission. When "rocking" a stuck vehicle by moving be­tween D (Drive) and R (Reverse), do not spin the wheels faster than 15 mph (24 km/h), or drivetrain damage may result. A feature designed to improve fuel economy has been added to the automatic transmission of this vehicle. A clutch within the torque converter engages automatically at calibrated speeds. This may result in a slightly differ­ent feeling or response during normal operation in high gear. When the vehicle speed drops or during accelera­tion, the clutch automatically and smoothly disengages. The transfer case provides four mode positions — two (rear) wheel drive high range, four wheel drive high range, neutral, and four wheel drive low range. This transfer case is intended to be driven in the two wheel drive (2H) position for normal street and highway conditions such as dry hard surfaced roads. In the events when additional traction is required, the transfer case 4H and 4L positions can be used to lock the front and rear driveshafts together and force the front and rear wheels to rotate at the same speed. This is accomplished by simply moving the shift lever to these positions. The 4H and 4L positions are intended for loose, slippery road surfaces only. Driving in the 4H and 4L positions on dry hard surfaced roads may cause in­creased tire wear and damage to the driveline compo­nents. The 4WD indicator light, located in the instrument panel, alerts the driver that the vehicle is in four wheel drive and that the front and rear driveshafts are locked to­gether. This light illuminates when the transfer case is shifted to either the 4H or 4L positions. NOTE: Do not attempt to make a shift while only the front or rear wheels are spinning. The transfer case is not equipped with a synchronizer and therefore the front and rear driveshafts speeds must be equal for the shift to take place. Shifting while only the front or rear wheels are spinning can cause damage to the transfer case. When operating your vehicle in 4L, the engine speed is approximately three times that of the 2H or 4H positions at a given road speed. Take care not to overspeed the engine and do not exceed 25 mph (40 km/h). Proper operation of four wheel drive vehicles depends on tires of equal size, type, and circumference on each wheel. Any difference will adversely affect shifting and cause damage to the transfer case. Because four wheel drive provides improved traction, there is a tendency to exceed safe turning and stopping speeds. Do not go faster than road conditions permit. Rear Wheel Drive High Range — Normal street and highway driving. Dry hard surfaced roads. Four Wheel Drive High Range — Locks the front and rear driveshafts together. Forces the front and rear wheels to rotate at the same speed. Additional traction for loose, slippery road surfaces. Neutral — Disengages both the front and rear driveshafts from the powertrain. To be used for flat towing behind another vehicle. Refer to "Recreational Towing" in Sec­tion 5 of this manual. Four Wheel Drive Low Range — Locks the front and rear driveshafts together. Forces the front and rear wheels to rotate at the same speed. Additional traction and maxi­mum pulling power for loose, slippery road surfaces only. Do not exceed 25 mph (40 km/h). Shifting between 2H and 4H can be made with the vehicle stopped or in motion. If the vehicle is in motion, shifts can be made up to 55 mph (88 km/h). With the vehicle in motion, the transfer case will engage/ disengage faster if you momentarily release the accelera­tor pedal after completing the shift. Apply a constant force when shifting the transfer case lever. With the vehicle rolling at 2 to 3 mph (3 to 5 km/h), shift an automatic transmission to N (Neutral) or depress the clutch pedal on a manual transmission. While the vehicle is coasting at 2 to 3 mph (3 to 5 km/h), shift the transfer case lever firmly to the desired position. Do not pause in transfer case N (Neutral). NOTE: Pausing in transfer case N (Neutral) in vehicles equipped with an automatic transmission may require shutting the engine OFF to avoid gear clash while completing the shift. If difficulty occurs, shift the auto­matic transmission to N (Neutral), hold foot on brake, and turn the engine OFF. Make shift to desired mode. NOTE: Shifting into or out of 4L is possible with the vehicle completely stopped, however, difficulty may oc­cur due to the mating teeth not being properly aligned. Several attempts may be required for clutch teeth align­ment and shift completion to occur. The preferred method is with the vehicle rolling at 2 to 3 mph (3 to 5 km/h). Avoid attempting to engage or disengage 4L with the vehicle moving faster than 2 to 3 mph (3 to 5 km/h). Failure to engage a position completely can cause transfer case damage or loss of power and vehicle control. You could have an injury accident. Do not drive the vehicle unless the transfer case is fully engaged. The Trac-Lok™ rear axle provides a constant driving force to both rear wheels and reduces wheel spin caused by the loss of traction at one driving wheel. If traction differs between the two rear wheels, the differential automatically proportions the usable torque by providing more torque to the wheel that has traction. Trac-Lok™ is especially helpful during slippery driving conditions. With both rear wheels on a slippery surface, a slight application of the accelerator will supply maxi­mum traction. When starting with only one rear wheel on an excessively slippery surface, slight application of the parking brake may be necessary to gain maximum trac­tion. On vehicles equipped with a limited-slip differen­tial, never run the engine with one rear wheel off the ground. The vehicle may drive through the rear wheel remaining on the ground and cause you to lose control of your vehicle. Key in ignition, vehicle in 4L (Low) range. 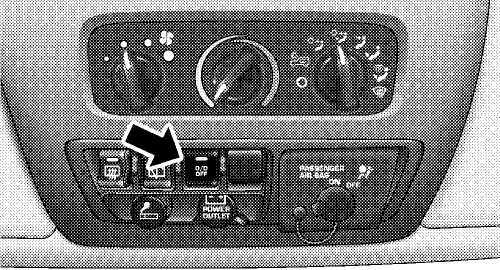 To activate the system, press the switch once to lock the rear axle only (the REAR LOCK indicator light will illuminate), press the switch again to lock the front axle (the FRONT LOCK indicator light will illuminate). Once the rear axle is locked, pressing the switch again will lock or unlock the front axle. NOTE: The indicator lights will flash until the axles are fully locked or unlocked. A chime will sound three times and the indicator lights will continue to flash at a different rate if the key is removed while the axles are still in the locked position. To unlock the axles, pull up on the switch. To set the parking brake, pull the lever up as firmly as possible. When the parking brake is applied with the ignition ON, the BRAKE warning light in the instrument cluster will light. NOTE: The BRAKE warning light indicates only that the parking brake is applied. It does not indicate the degree of brake application. NOTE: If the parking brake is applied and the vehicle is in motion, the BRAKE warning light will flash and a chime will sound. Before leaving the vehicle parked on a hill, you must make sure the parking brake is fully applied and place the gear selector in the P (Park) position (automatic transmission) or first gear (manual transmission). Make certain the transfer case is in gear. Failure to do so may cause the vehicle to roll and cause damage or injury. Always fully apply the parking brake when leav­ing your vehicle, or vehicle may roll and cause damage or injury. Also be certain to leave a automatic transmission in P (Park), or a manual transmission in 1st gear. Make certain the transfer case is in gear. Failure to do so may cause the vehicle to roll and cause damage or injury. If the parking brake is released, and the BRAKE warning light glows while the ignition switch is ON or the engine is running, there may be a brake system problem. Brake pedal travel, effort and stopping distances may increase, and you should obtain corrective service immediately. When parking on a hill, it is important to set the parking brake before placing the gear selector in P (Park), other­wise the load on the transmission locking mechanism may make it difficult to move the selector out of P (Park). The parking brake should always be applied when the driver is not in the vehicle. • Leaving children unattended in a vehicle is dan­gerous for a number of reasons. A child or others could be injured. Children should be warned not to touch the parking brake or the gear selector lever. Don’t leave the keys in the ignition. A child could operate controls or move the vehicle. To release the parking brake, pull up slightly, press center button, then lower lever completely. If the parking brake is not completely released, the BRAKE warning light will remain on. NOTE: Your vehicle has automatically adjusting rear brakes and we do not recommend any adjustment other than the maintenance performed by your authorized dealer. Your vehicle is equipped with power assisted brakes as standard equipment. In the event power assist is lost for any reason (for example, repeated brake applications with the engine off), the brakes will still function. The effort required to brake the vehicle will be much greater than that required with the power system operating. Riding the brakes can lead to brake failure and possibly an accident. Driving with your foot resting or riding on the brake pedal can result in abnormally high brake temperatures, excessive lining wear, and possible brake damage. You wouldn’t have your full braking capacity in an emergency. If either of two hydraulic systems lose normal capability, the remaining system will still function with some loss of overall braking effectiveness. This will be evident by increased pedal travel during application and greater pedal force required to slow or stop. Do not "ride" the brakes by resting your foot on the pedal. braking action, longer stopping distances, or brake damage. braking may cause skidding and loss of control. roads, in close-quarter maneuvering, parking or stopping. control. Under such conditions, engage 4-wheel drive. pedal action while driving at very slow speeds. a dangerous projectile in a sudden stop or collision. seats and use seat belts. loss of vehicle control may result. The Anti-Lock Brake System is designed to aid the driver in maintaining vehicle control under adverse braking conditions. The system operates with a separate com­puter to modulate hydraulic pressure to prevent wheel lock-up and help avoid skidding on slippery surfaces. All vehicle wheels and tires must be the same size and type and tires must be properly inflated to produce accurate signals for the computer. Significant over or under-inflation of tires, or mixing sizes of tires or wheels on the vehicle can lead to loss of braking effectiveness. The Anti-Lock Brake System conducts a low speed self-test at about 12 mph (20 km/h). If for any reason, your foot is on the brake when the vehicle reaches 12 mph (20 km/h), this check will be delayed until 25 mph (40 km/h). The Anti-Lock Brake System pump motor runs during the self-test and during an ABS stop to provide the regulated hydraulic pressure. The motor pump makes a low humming noise during operation, this is normal. During off-road use, loss of traction can temporarily defeat the system and cause the warning light to illumi­nate. Turn the ignition OFF and ON again to restore Anti-Lock Brake System function. Pumping of the Anti-Lock Brakes will diminish their effectiveness and may lead to an accident. Pumping makes the stopping distance longer. Just press firmly on your brake pedal when you need to slow down or stop. brakes and tires or the traction afforded. or the safety of others. The Anti-Lock Brake System is subject to possible detrimental effects of electronic interference caused by improperly installed aftermarket radios or tele­phones. NOTE: During severe braking conditions, a pulsing sensation may occur and a clicking noise will be heard. This is normal, indicating that the Anti-Lock Brake System is functioning. conventional 2-wheel drive vehicles any more than low-slung sports cars are designed to perform satisfactorily in off-road conditions. If at all possible, avoid sharp turns or abrupt maneuvers. As with other vehicles of this type, failure to operate this vehicle correctly may result in loss of control or vehicle rollover. When driving off-road, shift to 4L (Low) for additional traction in pulling forward or descending a hill, for low-speed pulling power or to improve handling and control on slippery or difficult terrain. Also use 4L (Low) in rain, ice, snow, mud or sand to get heavy loads rolling, or whenever 4H (High) range four-wheel drive traction will not do the job. In heavy snow, when pulling a load, or for additional control at slower speeds, shift the transmission to a low gear and shift the transfer case to 4L (Low) if necessary. Don’t shift to a lower gear than necessary to maintain headway. Over-rewing the engine can spin the wheels and traction will be lost. Do not downshift on icy or slippery roads because engine braking may cause skidding and loss of control. When driving on soft sand, reduce your tire pressure to 15 psi (103 kPa) minimum to allow greater tire surface area. You must return the tires to normal air pressure before driving on pavement or other hard surfaces. NOTE: Reduced tire pressures below 15 psi (103 kPa) may cause tire unseating and loss of air pressure. Before climbing a steep hill, change transmission to a lower gear and shift the transfer case to 4L (Low). Use first gear and 4L (Low) for very steep hills. help regulate your speed. If the brakes are required to control vehicle speed, apply them lightly and avoid locking or skidding the tires. If the engine stalls or you lose headway or cannot make it to the top of a steep hill or grade, never attempt to turn around. To do so may result in tipping and rolling the vehicle. Always back care­fully straight down a hill in R (Reverse) gear. Never back down a hill in N (Neutral) or with the clutch pedal depressed, using only the brake. Remember, never drive diagonally across a hill, always drive straight up or down. If the wheels start to slip as you approach the crest of a hill, ease off the accelerator and maintain headway by turning the front wheels sharply left and right. This will provide fresh "bite" into the surface and will usually provide traction to complete the climb. Shift the transmission into a low gear and transfer case to 4L (Low) range. Let the vehicle go slowly down the hill with all four wheels turning against engine compression drag. This will permit you to control the vehicle speed and direction. Off-road operation puts more stress on your vehicle than does most on-road driving. After driving off-road, it is always a good idea to check for damage. Completely inspect the underbody of your vehicle. values specified in the Service Manual. After extended operation in mud, sand, water, or similar dirty conditions, have brake drums, brake linings, and axle yokes inspected and cleaned as soon as possible. Abrasive material in any part of the brakes may cause excessive wear or unpredictable braking. You might not have full braking power when you need it to prevent an accident. If you have been operating your vehicle in dirty conditions, get your brakes checked and cleaned as necessary. If you experience unusual vibration after driving in mud, slush or similar conditions, check the wheels for packed material. Packed foreign material can cause a wheel imbalance and freeing the wheels will correct the situation. NOTE: P(Passenger)-Metric tire sizing is based on U.S. design standards. P-Metric tires have the letter "P" molded into the sidewall preceding the size designation. Example: P215/65R15 95H. NOTE: LT(Light Truck)-Metric tire sizing is based on U.S. design standards. The size designation for LT-Metric tires is the same as for P-Metric tires except for the letters "LT" that are molded into the sidewall preceding the size designation. Example: LT235/85R16. NOTE: Temporary Spare tires are high pressure com­pact spares designed for temporary emergency use only. 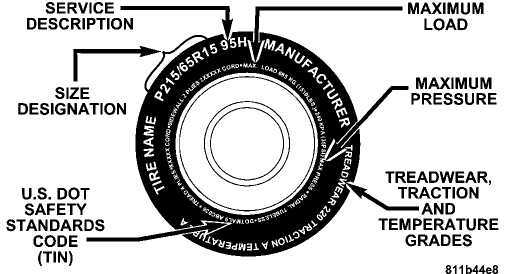 Tires designed to this standard have the letter "T" molded into the sidewall preceding the size designation. Example: T145/80D18 103M. NOTE: High Flotation tire sizing is based on U.S. design standards and begins with the tire diameter molded into the sidewall. Example: 31x10.5 R15 LT.